In the year 2001, it cost .79 cents to make a penny. Now, as of 2017, it costs 1.50 cents (it cost 2.41 cents in 2012). 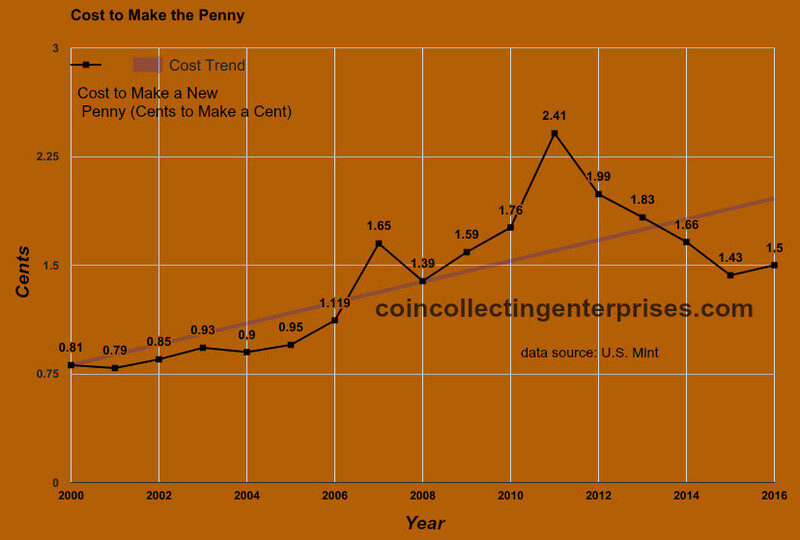 That’s good news for a decline in cost, but, it still means a heavy burden to make the little one-cent coin. This is more than 2x production cost over a very short amount of time. The U.S. Mint is supposed to generate revenue to offset its expenses in minting U.S. coins. The penny production cost heavily outweighs the income of minting and selling the penny. Inflation and commodity price increases clearly are making producing the penny unsustainable. Prior to 1982, the penny was made of 95% copper and 5% zinc. To reduce the minting cost, the metal composition of the penny was changed to 97.5% zinc and 2.5% copper. A rising global demand for metals mixed with a United States currency devaluing policy of printing unlimited amounts of new U.S. dollars (read more on Hyperinflation and Coins) has resulted in the minting process of the one cent coin to be noticeably unprofitable. Will another change in the penny’s metal composition fix the problem? The United States government has been entertaining the idea of changing the metal composition of the penny once again. As of December 2011, a proposition to change the penny to a steel alloy has been proposed (read more: Penny Composition Change to Steel). Steel may become magnetized which would pose many issues for various coin counting and coin accepting machines throughout the country that reject magnetic coins as a fraud preventative measure. The expense to change these machines, as well as the shorter lifespan of a steel cent, may make this metal composition change a short-lived solution. In addition, the theory of Gresham’s law that bad money drives good money out of circulation would mean a higher probability that a change to steel would have copper penny investors also pulling out and investing in the zinc pennies, driving a need to produce more newer cents. After all, if it is not profitable to make pennies out of zinc, then that is proof that zinc prices have been on the rise compared to the face value of the one cent coin. This would result in higher cost to mint new coins to replace the older, more valuable ones being pulled out of circulation. Instead of saving money, the opposite effect would very likely be the result: Higher minting costs and zero successful solutions. The proof of Gresham’s law goes beyond gold and silver coins, to also include the U.S. penny. People collect and invest in copper pennies by the pound or ton (read more on How to Make Money with Copper Pennies). Copper pennies are seen as a low-risk method of securing wealth in commodities below copper market prices while being backed by the floor pricing of the penny’s face value.